The Japan Meteorological Agency announced this summer is the hottest since the survey started in 1898. We are having a relentless heat wave. I long for autumn. Owara Kaze no Bon(おわら風の盆) is a festival held from September 1st to 3rd to pray for an abundant harvest and protection of planted rice from high wind due to typhoons at Yatsuo in Toyama Prefecture. From early evening until dawn, people dance in the streets. 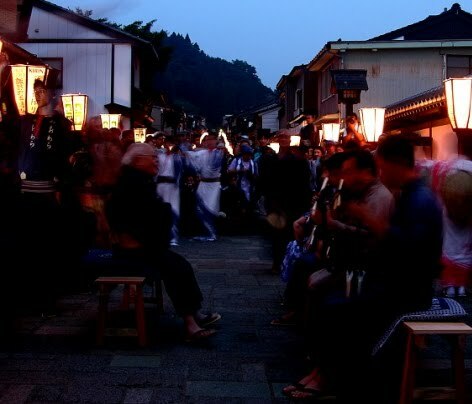 Originally, Bon dance was held from early evening until dawn. People used to gather and dance spontaneously to welcome the spirits of the dead in the early evening and to send off them at dawn. People danced on the border between this world and the netherworld, such as waterfront, sites of temples or shrines and junctions of streets. After send-off ceremony, people never look back, or the spirits come along. The original form of Bon dance is inherited in some areas. The most distinctive feature of Owara Kaze no Bon is melancholic music using an instrument named kokyu (胡弓). In the Edo Period, kokyu was very popular as one of three major accomplishments for women, along with shamisen(a three-stringed instrument of the lute family) and koto(a stringed instrument made of wood with 13 strings). Now it's not popular. The festival continues until dawn even after most tourists go to their accommodation. Yatsuo is a small town but a popular sightseeing spot, so it becomes very crowded during the festival.